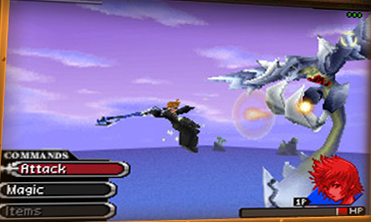 The first game in the series to be released on the Nintendo DS, Kingdom Hearts 358/2 Days has a mix of new and old game play features; the foundations are the same and, interestingly, the game doesn't choose to make full use of the DS's touch screen capabilities, but introduces a panel system akin to the card system of Kingdom Hearts Chain of Memoriesalong with a new 'limit break' feature for each of the nineteen playable characters. By this, you are handed complete control of how you wish to customize your character, adding an extra dimension apart from the standard game play seen in the main titles of the series. Once at the title screen, you are introduced to three modes: story mode in which the story of the game takes place, where you can replay missions you have not completed or access new missions you did not play, or alternatively do challenge missions where you are to meet set requirements to gain challenge sigils which can be used to buy items; mission mode in which you are given the option to go through 'holo-missions' (missions that you have already played but wish to replay in order to attain mission crowns which are used to buy items) either on your own or with friends using the DS's Wi-Fi facilities - here you can choose any of the thirteen members of the Organization to play as, though more are added after meeting in-game conditions; and theatre mode in which all cinematics are saved as you progress through the game to watch of your own volition. The game makes use of all the buttons: A is used to attack, to talk or to examine; B is used as a back button, to cancel, and during missions functions as the jump button; X is used to cipher through the command menu; Y goes straight to the panel menu but when on a mission is a block command; start is the traditional 'pause' option where you can choose to continue or withdraw but between missions goes straight to the main menu; select acts as a zoom tool; L brings up the shortcut menu to which you can assign shortcuts to magic; R is used to change the camera angle when moving; and the touch screenallows you to move the camera in all directions. Continual game play themes are brought back including the traditional HP bar though it is displayed as a single bar with two sections of green and yellow. The green section signals health; the yellow bar is a sub-meter named the Alarm Zone - it is during this Zone that your lack of health is made up by the activation of the new feature, Limit Break, by holding A. Like Chain of Memories, 358/2 Dayshas no magic meter, but implements a 'choose your own spells' system, by which you equip magic panels. Likewise, the only way to replace magic once all panels are used is by ether or elixir. Items are equipped by the same manner though extra items may be collected during play. The most notable new addition to the game is its panel system which is similar to the card system of Chain of Memories in the sense that you can customize your character to your liking; however, unlike Chain of Memories, you don't have to cycle through commands. 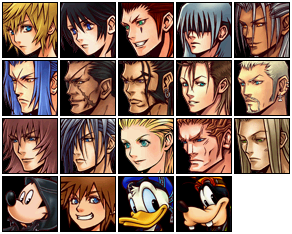 The panel board has a limited number of spaces when you start the game but goes up to a maximum of 120, leaving you plenty of space to attach the various panels; items, magic, abilities, accessories, Keyblades and their various attachments which can alter said weapon's power and abilities. 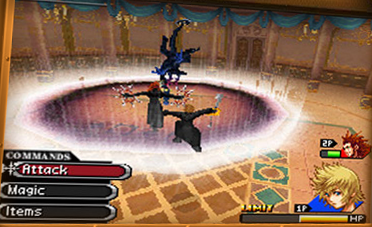 Another of the game's new features includes the aforementioned Limit Break, during which the character releases his or her most powerful and devastating personal attacks like a self-defence mechanism; you may also equip a Final Limit panel which releases an even more powerful array of attacks at the end of Limit Break. However, Limit Breaks are short-lived, so it is advised that you carry health supplements to avoid fainting. All of this makes for fresh and innovative game play as you fight through the missions, given to you by Saïx, which happen over 351 days. Some missions are obligatory but some are extras and are added to Saïx's list by other members. These extras aren't compulsory and are added as holo-missions for you to play when you want. Though most missions are composed of collecting hearts, defeating problematic Heartless and doing recon, there are cut-scenes and missions that progress the story as well as showing the development of the friendship between the three main characters, Roxas, Axel and Xion. The missions are divided between Roxas by himself and Roxas paired with other characters in which you can see other characters' fighting styles. Your partner usually follows your command; i.e. when you jump they will jump, when you attack they will attack. This tight-knit cooperation with others makes the game a fresh experience, along with its other new themes mixed with the old, making you sure to enjoy yourself during every second of play.